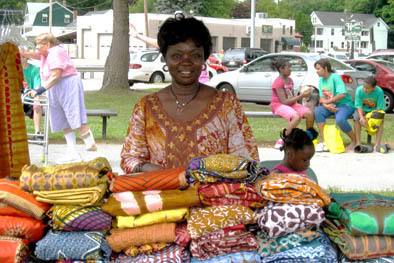 The 9th annual African Festival in Lowell took place on June 20, 2009. The Sampas Pavilion off Pawtucket Blvd. was filled with art vendors selling African patterned clothes and fabric, musical instruments, jewelry, paintings, and more. There were chefs, community service organizations, and even a history display. Festival goers enjoyed traditional African food (plantains, peanut butter spinach and curried goat), drink, music, and dancing. Throughout the festival all nationalities represented were invited on stage to dance with their fellow countrymen. The festival is open to all, but is really a celebration of African heritage and a unity of the African community in Lowell. The festival starts with music and prayer and features a keynote speaker, children's essay competition, and fashion show. Notable performances from 2009 included Allee McCaulley, a West African who teaches African Culture and Art and is a trained storyteller; renowned musician, griot, and kora player Balla Tounkara from Mali; North African and Middle Eastern dance by Morgana Mirage; and a seven-piece Senegalese band led by drummer and rhythm guitarist Mamadou Diop. Eleven year old Cameroonian American, Anye Nkimbeng, who won the essay award, spoke of how the African Festival reaffirms his identity, his responsibility to his community, and helps him share his heritage. "The community is like my home. For the past four years I have taken time away from my video games to help set up the African Festival with my dad, because I wanted to do that. " It was a moving and thoughtful piece. The festival is put on by the African Cultural Association, Inc., which was created after the first African Festival in Lowell in 2000. The ACA's focus is to provide a support network for Africans in the Merrimack Valley and Boston area, working to deal with common issues, opportunities and concerns. The 2009 festival committee had seven members and represented five African nations.